"We all have our favorite flies. Often, they become our favorites already at the vise, without having been in the vicinity of a leader, let alone a fish. You just feel deep inside that they must to be good, and because of that they get a lot of chanses and, with time, catches a lot of fish. These flies have made the easy route to a place in the fly box parlor, like the CDC-12 - you need only to look at it once to get a new favorite pattern. Opposite to this, the journey's secret weapon has taken the hard, thankless path, to a location on The Graylingers fly cast! The Graylinger was not at all satisfied with result that the first evening´s fly cast had shown. The GHE-12 was good, but not as good as expected. The Graylingers, since childhood most cherished fly, the Black nymph, did not at all live up to the expectations, and the third fly - the usually murderous efficient GLSSCCSe 2 - fished so bad that they subsequently had difficulty remembering if it ever was there on the leader or not. Now, a dramatic change was required, and that was why The Graylinger dug himself so deep into the fly boxes forgotten domains that he found The One. Neither The Graylinger, nor Raven, really harbored any great faith in The One, and that gave the fly the place at the top of the leader, placed as "the third fly". Normally this means that the fly will do very frugal footprint in the fish stock. Though, they soon understood that they had misjudged The One, and before the evening was over it had taken over the place as "the number two" fly on the leader. 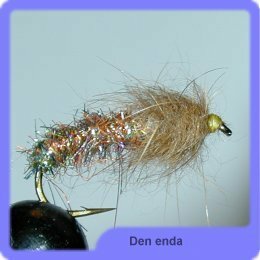 It actually deserved to sit on the end of the leader after the first evening fishing, but for a fly fisherman, most changes are preceded of a not insignificant resistance, and The Graylinger was most unwilling to switch place with the GHE-12. The following day, The One took step to the end of the tippet. It had by then catched a big fat grayling from the depths, and enough was enough even for The Graylinger that somewhat reluctantly changed positions of the flies. The One did thank for the confidence and, once it reached the best place on the leader, completely outshone its rivals. There were only a concern - they only had one copy of The One. The last day, the inevitable happened. Their only The One was lost in the mouth of a big grayling, and The Graylinger and Raven was devastated as they sat in the boat, looking at the cut off tippet. According to the plans, they would go home the next morning, but after a few uneventful turns with the boat they gave up the adventure, packed their things, got into the car and drove home. For the upcoming seasons, neither Raven, nor The Graylinger, will travel anywhere without a hefty set of The One as a part of the luggage!" "The first few laps just gave some smaller ones, and The Graylinger began to wonder if the drizzle in the face actually was beginning to feel pretty annoying after all, when he suddenly felt a sharp stroke on the lighter rod. When the sensation of a stroke varies depending on the speed on the boat, The Graylinger, with some uncertainty in his voice exclaimed: "it felt pretty nice". "It is much larger than the great one we had before, I saw when it jumped" said Raven who now almost stood up in the boat. 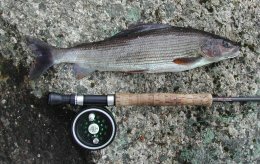 The grayling (and The Graylinger) had to calm down for a while before the rod was handed over to Raven who was best positioned for fighting the fish. He smoothly and methodically cranked the fish in and finally The Graylinger was able to grab the huge grayling and lift it into the boat. The fish was nicely hooked on a The One Derivatives 1. They just sat there and looked at it for a good while. "So damn large it is," Raven said. "It is a grayling-monster" The Graylinger said. They fished for a while longer, but soon felt that they really would rather celebrate the big grayling in the way it deserved - by creating a nice dinner with it as the main course. Saturate, contented and slightly drunk they fell asleep with a happy smile on their faces, this the last night in Stora Harrträsk for this time." The second citation mentions a The One Derivatives 1, so what is that then? Well, the difference is that the Derivatives 1 only consists of flash dub, also the thorax when compared to the original The One. This improvement has shown to be working really well. Over the years we have tried several other Derivatives by testing different colors, but none of those have been any real success, it is the mixed flash dub you must get a hold of if you want what the grayling seems to like the best - Derivatives 2, 3 and 4 are now passed to the above mentioned forgotten domains of the fly boxes. 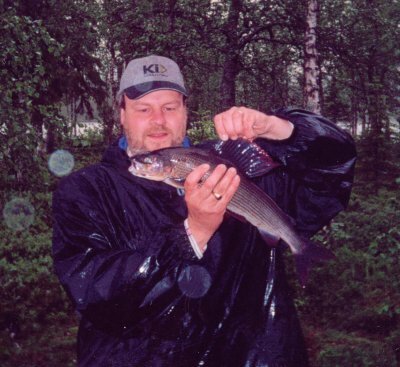 What has really proven to work though is the The One With Head - when you want to fish deeper you choose one of those, and if you want to fish even deeper you choose a well led-weighted The One With Head. The One is a weapon to really consider when searching for grayling - you can fish it from just under the surface or right at the bottom, depending on the conditions - if the grayling is there, you have a really good chance to get it to take!